How can oppression be mitigated in a classroom? What can be done in the case of inequity? 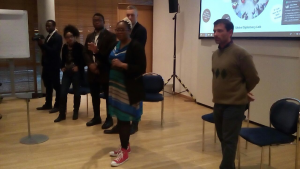 These are some of the questions addressed at the GDL workshop on "Raising Awareness of Unconscious Bias in the Classroom through Forum Theatre", held at the UN Global Festival of Action on 22 April 2018.The co-facilitators, Amarachi A. Igboegwu (a GDL Member) and Angelo Miramonti (a Forum Theatre practitioner), provided some 25 participants with a taste of forum theatre as a channel for discussing oppression in the classroom. Uncovering unconscious bias in the classroom is a step in the right direction towards providing equitable and inclusive education to all learners (UN Sustainable Development Goal #4). The GDL, a platform for interdisciplinary professionals who are passionate about creative engagement and devising innovative ways to tackle the challenges of diplomacy in the 21st century, provided the workshop with thought-provoking insights on the impact of “miseducation”, especially of students with lower socio-economic means. With plenty of laughter and intriguing amateur acting, participants suggested solutions not by explaining their position and ideas per se, but rather by acting out their interventions and gaining feedback from the audience. The experience had an equally strong impact during the question-and-answer session. Participants wanted to know more about Forum Theatre and its application to other challenges facing society. They were also able to reflect on the impact of unconscious bias in their day-to-day lives. One participant explained to the group how he had come to view his own unconscious bias towards gender. The Forum Theatre experience was eye-opening for him, as well as for the actors and participants in general. Although the allotted time was short (90 minutes), the audience was encouraged to think about how it makes meaning of day-to-day experiences and the pervasive impact of unconscious bias in their lives. It is clear that more exchanges of this sort are needed. 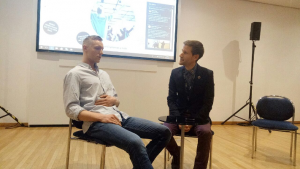 One participant suggested involving teachers and parents in Forum Theatre workshops as a means of raising awareness and bridging educational deficits in the school system. More importantly, it has become increasingly evident that high-quality education for all is essential to a stable democracy. The more learners are provided with such opportunities, the better off we all stand to be in the long run. 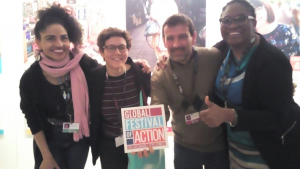 The Global Festival of Action took place from 21-23 March 2018 in Bonn. The festival was organised by the UN SDG Action Campaign with the support of the German Federal Ministry for Economic Cooperation and Development and the Federal Foreign Office. The purpose of the UN SDG Action Campaign is to ensure the SDG agenda is brought to life and to push for better representation of the Global South. It is important to mention that the 2030 Agenda is more than the sum of SDGs. It presents the 5 Ps and thereby adds Peace and Partnerships to social inclusion (People), environmental protection (Planet) and economic growth (Prosperity). The annual festival tackled the challenges of our time by providing a platform for exchange and partnerships to effect transformative change. 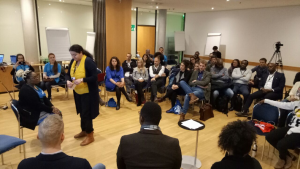 It sought to showcase good practices in different parts of the world, to examine challenges from multiple angles and to foster collective action. The festival went beyond a regular conference since the sessions embraced a wide range of formats such as high-level panels, snappy talks, and skill-sharing workshops. The main thematic areas were innovation approaches, citizen engagement, communicating SDGs, mobilising action and multi-stakeholder engagement. 21 March 2018: Nicola Forster – 'How to' session! Open Situation Room on SDG implementation: Developing innovative project ideas with design thinking. 22 March 2018: Sabrina Schulz and Nicola Forster – 'How to' session! Open Situation Room on SDG 17: Developing innovative partnerships between civil society and business. 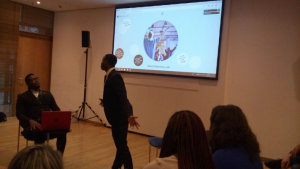 22 March 2018: Amarachi Igboegwu – Raising awareness of unconscious bias in the classroom as a step towards inclusive and equitable quality education (SGD 4) through Forum Theater.